We want to thank all of you, are coaches for the tremendous response to our Lacrosse Coaches Site! The feedback has been awesome and we are working to provide even more great content for you and your teams! We are starting to get more requests for some type of Group License Discounts. Many coaches would like to have all of the Lacrosse Coaches in their system have access via Premium Membership to the entire site including the growing library of podcasts with the top coaches in the country. Many Lacrosse Coaches would like for their Rec and Youth Program Coaches to be able to learn more about coaching lacrosse through some type of package program. Do to this growing concern we are now offering a Group Pricing License to groups of Coaches. Unlimited Access, $500.00 per year, or a savings of over 40%!!!! Unlimited Access, $800.00 per year, or a savings of over 50%!!! Billing: The Billing will significantly discounted and paid via a single check or credit card as an Annual Fee. With the nature of this unique program, all invoicing will be manual. We will send or email an email to the School, Booster Program, or Rec Department an Invoice for the entire year. 2. Have each of the coaches then register and join the site individually as Free Members. This gives them a unique username and password, and also allows us to individually track and monitor access to the site. If they are already Free Members make sure they provide you the same email address they used to register initially. 3. 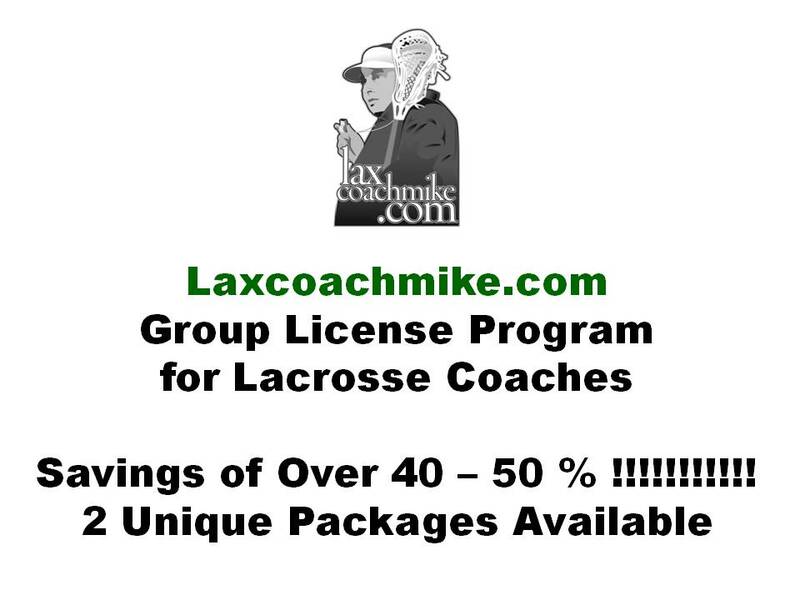 Via email to mike@laxcoachmike, using the reference; License Package 1 or License Package 2 in the ‘Subject Line’ please submit the email addresses of the coaches you want to include in the License Program, and a Group Name you would like on your License. And provide contact email and telephone number of the primary contact Coach on the License. 4. In the same email provide an email or Name and Billing Address and we will send or email the Invoice for the appropriate License Package. Or, if you would like to pay with a single credit card payment for the year, we will take your credit card over the telephone. 5. When the payment is received we will upgrade the names on your License list to Premium Members on our end of the site and those coaches will have full access for twelve months. 6. All License Payments are Non-Refundable, although we can change the names eligible to have access to the site, staying within the current term of the License Agreement. 1. Can we modify the number of coaches outside of the two packages available? A. Unfortunately since this is a totally manual process for us, we are only offering the two License Packages at 1-5 Coaches, and 6-10 Coaches at this time. 2. If I am already a Premium Member, can I modify my Membership to be included in a License Package? A. Sure, in fact we anticipate many of our Members doing so. 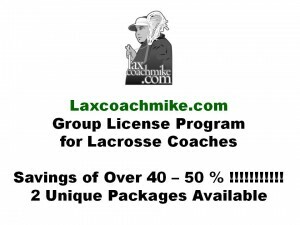 But, you must cancel your monthly payments with PayPal, then send me an email at mike@laxcoachmike.com, giving me the circumstances and details including the Group Name on the License so I can insure you have access under the License. 3. Can we share access with others that are not in the License Package on occasion? A. No, if we see repeated use or entry of names and passwords, or use under a single name from two different computers at the same time with the same passwords we will terminate the entire license. Lacrosse is a game of integrity and we are trusting that our Members and Coaches will respect the work that has gone into the development and content on our site. 4. If we do not fill the entire amount of coaches in our License can we add coaches up to our limit later? A. Absolutely, but the term of the License will be 12 months from initiation for all, regardless of when they are added. Article: LIU 5V4 GB into transition into fun!